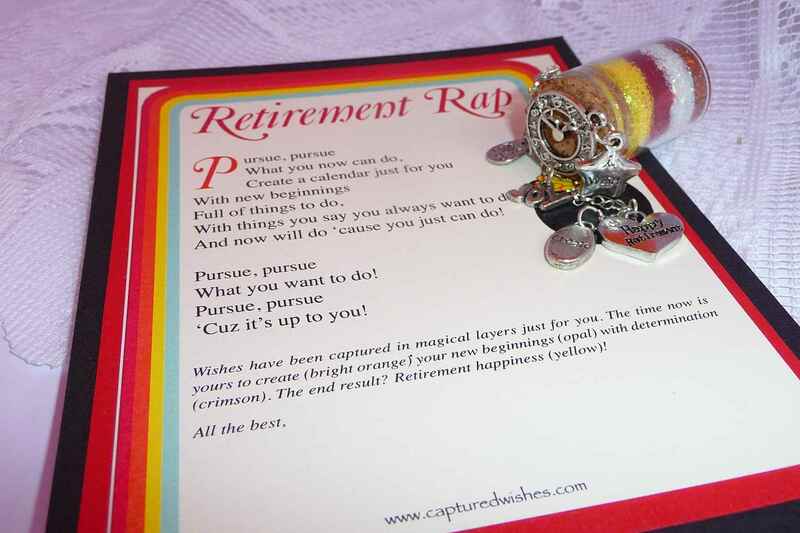 Retirement Wishes: Captured Wishes Rap! Who wouldn't be surprised by perfect retirement wishes caught in a unique, handmade Captured Wishes vessel! This gift includes a funky 'Retirement Rap' poem that puts it all into perspective: how much fun retirement can be with promises of a busy fulfilled life that now holds new beginnings! Great wishes await! This beautiful Captured Wish (height approx 30mm x 15mm width) sums up everybody's feelings at the bittersweet moment of retirement. Featuring a clock face and a unique blend of 'fairy dust' in a rainbow of colors, it captures the essence of the retiree having time to themselves after years of selflessness, and the myriad of options available post-retirement. If you're looking for truly interesting personalized retirement gifts idea, then this Captured Wish is the perfect choice!